Our hotel in Vipiteno/Sterzing is a little gem in South Tyrol. Hotel Lilie is located right in the pedestrian zone of Vipiteno. Here, you enjoy holidays in South Tyrol in a peaceful setting, while benefiting of the immediate vicinity to the city centre. Our 4-star hotel in South Tyrol looks back at a history in hospitality of five centuries. The former burgher house was built in the Late Middle Ages. Today it is one of the most beautiful buildings in Vipiteno/Sterzing, a treasure of fine arts, protected by the state. Inside the magnificent medieval vaults, you find many traces of its fascinating past. The charm of his hotel is hard to pin down. It might be the perfect combination of a rich history and modern comfort. The hosts Ilse and Christian Tatz offer you here, in this elegant ambience, a unique and unforgettable holiday in Vipiteno/Sterzing. Our lovely hotel in Vipiteno/Sterzing is the perfect place for all who are looking for an escape from every-day life, who are after some well-deserved peace and relaxation. Unwind in our little spa oasis with Finnish sauna, steam bath and infrared cabin and take in the unique ambience: the lovely fragrance, the flickering candle light and the soothing heat. Here, it is all about harmony for body and mind. Each one of our 15 rooms is unique and shows a great deal of love for detail – just in line with the special character of our 4-star hotel in Vipiteno/Sterzing. The Late Gothic style of the building creates an extraordinary ambience, making for city holidays to remember, topped up with lots of flair and charm. First-class cuisine demands first-class service. Both are a given at our Hotel Lilie. Enjoy delicious and healthy cuisine combining light Mediterranean as well as traditional South Tyrolean meals, freshly prepared with mainly regional and seasonal products. Along with your meal taste a selected wine from our quaint wine cellar. To top off your culinary experience, finish off with a lavish dessert from the hotel’s pastry shop and confectionery. If you wish to enjoy these irresistible delights also from home, visit our delicatessen and help yourself to a selection of homemade delicacies. 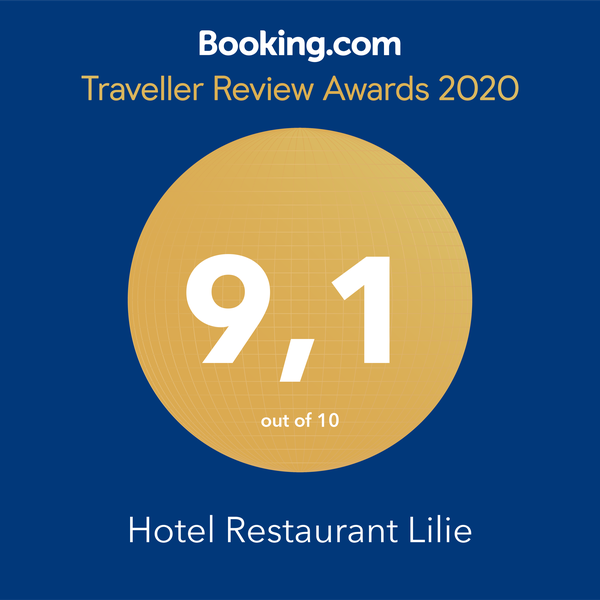 It is our mission to offer our guests a great holiday at Hotel Lilie, filled with lots of lovely moments to remember for a long time to come. We want to make your stay at our hotel in Vipiteno/Sterzing as pleasant as possible. This is why we highly value your feedback. We are proud to announce that our hotel in Vipiteno has already won a variety of awards, such as the TripAdvisor Certificate for Excellence, three years in a row. Booking.com has also honoured us by proclaiming us the Award Winner 2015. We are very happy about these recognitions and we thank all our guests for their positive reviews.